The cleanroom fume hoods and cleanroom glove boxes supplied by NCI are constructed of several different materials, depending upon your particular application’s needs. These laminar flow hoods and glove boxes include clean room stainless steel, standard, white polypropylene, fire retardant polypropylene, clear acrylic, clear PVC and fiberglass. 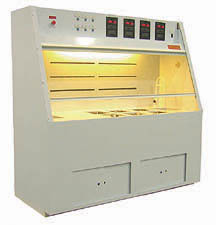 Several design styles are available for our laminar flow hoods and glove boxes. Pre-engineered clean room options such as sinks, spray guns, hot plates, etc. are then added to create a ‘custom configuration’. Call us to discuss your specific requirements (888-270-0458). Many of the products listed in this section can be used to achieve compliance of USP 797.